In our last blog post on this topic we highlighted the importance of the consumer notebook segment and its reliance on higher capacity points at the lowest possible price point, hence favoring hard disk drives. SSD prices have been on a free fall for the last six months, and SSDs can be purchased for around $0.40/GB. If this type of price erosion continues, and the transition to 3D NAND finally hits with multiple vendors, SSD prices could plummet to as little as $0.15/GB in the 2019 time frame. 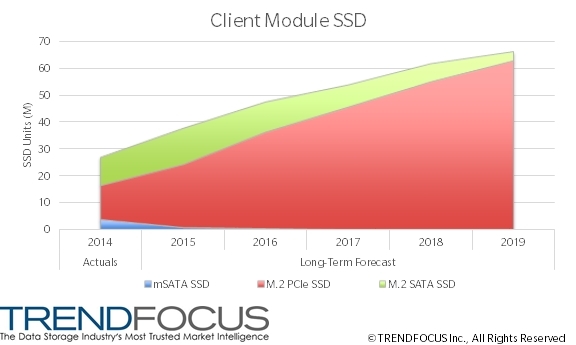 Even though SSD pricing, on a $/GB metric, will not reach HDD levels by 2019, the lower storage capacity required by some end markets, such as commercial notebook PCs, will result in an acceptable device cost for PC vendors to deploy SSDs into a broader range of PC models. Thus the value proposition of SSDs will increase over time, fueling adoption. Currently, 256 GB represents about 36% of all client SSDs, but that percentage will grow to nearly 60% in 2019, as it strikes the proper balance of cost and storage capacity. This demand will be driven by both drive form factor (2.5”) and modules (M.2) in the commercial notebook segment. The module segment will see most of its growth utilizing PCIe. Below is a trend chart illustrating the aggressive PCIe ramp in the module SSD market, again, driven mainly by commercial notebook PCs. This entry was posted in TRENDFOCUS Blog and tagged Client, M.2, mSATA, SSD. Bookmark the permalink.